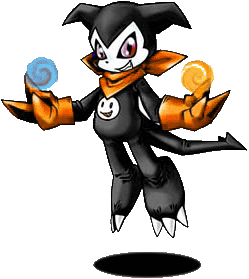 A Rookie-leveled Digimon with a demon child-like appearance. He looks forward to deceiving the opponent in many ways, from his almost adorable appearance to his collection of practical jokes. 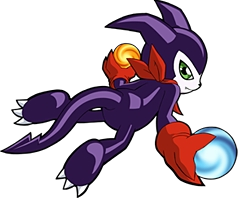 When Impmon appears, electrical appliances around him temporarily corrupt, and some say that when these gadgets freeze up and become obsolete, it may be because Impmon has played one of his tricks on them. 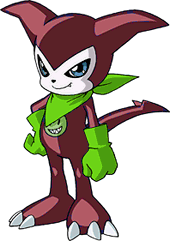 This Digimon loves evilness and bad-hearted people, but he prefers to confront stronger opponents with his bold and brash attitude. Despite this, however, he feels lonely deep down and also has unpleasant aspects about him. He likes to attack the opponent with "Summon", where he summons the elementals of fire and ice. 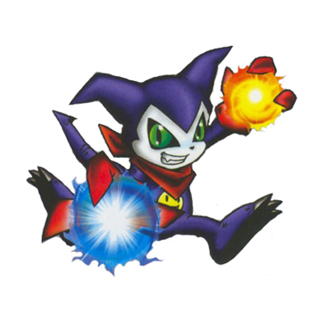 His special attack is "Night of Fire", where he attacks the enemy with a dark flame. Origin / English. Imps are small demons. Origin / English. Imps are small demons. The Digimon you are viewing now is categorized as a Costume Change. There is no information about their attribute or type, so I list them as having the same as their originals. 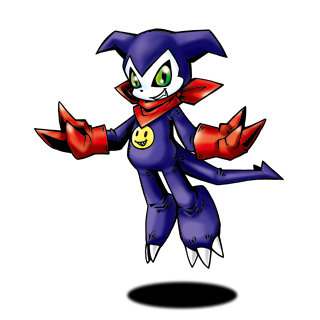 This Digimon appeared in the Digimon fighting games as a type of recolors. 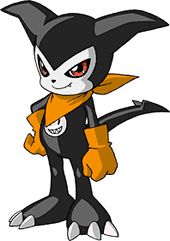 In fighting games, when two people pick the same character, the first player has the Digimon with the original colors and the second player has the Digimon with the different colors. Any attacks and any evolutions these Digimon might have are listed under the original version's Digi-Dex entry.